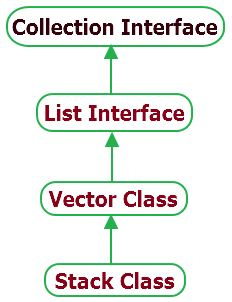 Stack class in java is one of the collection interface class which is subclass of Vector class. Stake class supports usual push and pop operations. In contrast to queue, Stack class has last-in first-out(LIFO) data structure. So item which is inserted at top will be available first. Stack class extends Vector class of List interface so it includes all methods of vector class and also it has it's own several methods to perform push and pop operations like looking top item from stack, removing top item from stack, push new item at top of stack, searching item from stack and check whether stack is empty. boolean empty() : This method of stack class will help you to check if stack is empty. Object peek( ) : It will look and return top element of stack. It will not remove element from stack. Object pop( ) : It will remove item from top of the stack and return the value. int search(Object o) : It will determine if object is exist in stack. If exist then it will return item's index. Top item of stack has index = 1. Below given practical example of java stack class will show you how above methods work. //Initially stack will be empty. //Get top item from stack. //Print stack items after peek. //Get and remove top item from stack. //Print stack items after pop. //Push new item in stack. //Print stack after inserting new item. //Search item from stack which is available. //Search item from stack which is not available in stack. Now i think you will understand how and when to use stack class in java.